Hello, in this post we will discuss how to modify, update and cancel e-way bill under GST in case of any changes required. We will cover the following. 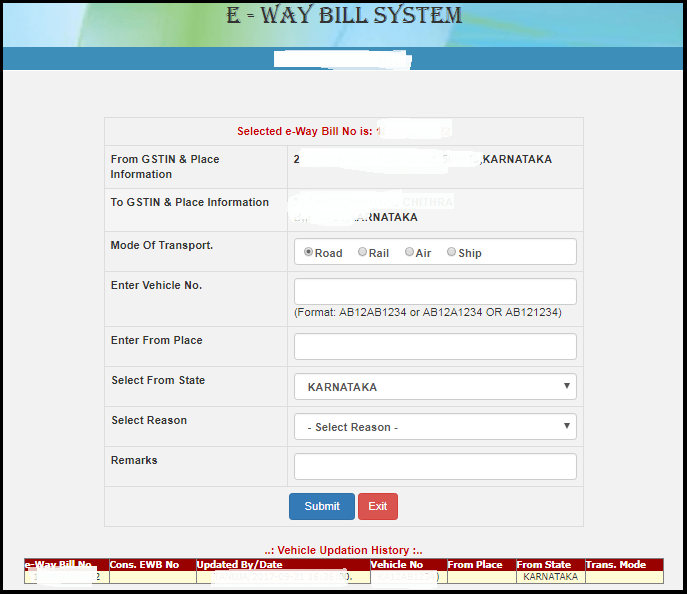 While generating an e-way bill Vehicle number is optional. But, an e-way bill without the Vehicle number is not valid for the movement of goods. The e-way bill portal provides you with the option of updating vehicle number, it can be used in the following cases. The goods are shifted to another vehicle / conveyance during transit due to break down or any transshipment. 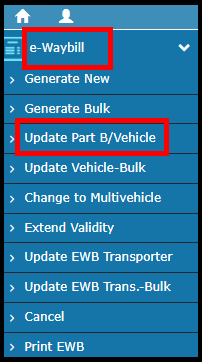 Step-2 On selecting Update Part B/ Vehicle the following screen appears. Here select the appropriate option and enter the e-way bill number and click on “Go”. List of filtered e-Way Bills will appear according to your choice. Select the relevant e-Way Bill for which you want to update the vehicle number. The e-way bill gets updated and if there are any errors it will be displayed on the screen. Originally assigned Transporter/ seller who generated Eway bill can change/ re-assign the Transporter ID thereby replacing the existing transporter with a new transporter. If the originally assigned transporter assigns another transporter by changing the Transporter ID, then the seller cannot make any changes. Step-1 Under e-way bill, select Update EWB transporter option. The updated Eway bill appears on the screen. Click on Print to print the E-way bill. If the goods were not transported as per the details given in the e-way bill, then the generator of that e-way bill can cancel the e-way bill. E-way bills can be canceled by the Generator of that e-way bill only. The time-limit to cancel is within 24 hours of generating the e-way bill. Once canceled, it is illegal to use such E-Way Bill. If the e-Way Bill is verified by any empowered officer it cannot be canceled. Step-1 Click on the e-way bill option and select Cancel from the drop down. This ends the post. Let us know your opinion by commenting below.